The smartphone industry has seen both remarkable successes and remarkable failures over the last two decades. Developments have frequently confounded the predictions of apparent expert observers. What does this rich history have to teach analysts, researchers, technology enthusiasts, and activists for other forms of technology adoption and social improvement? 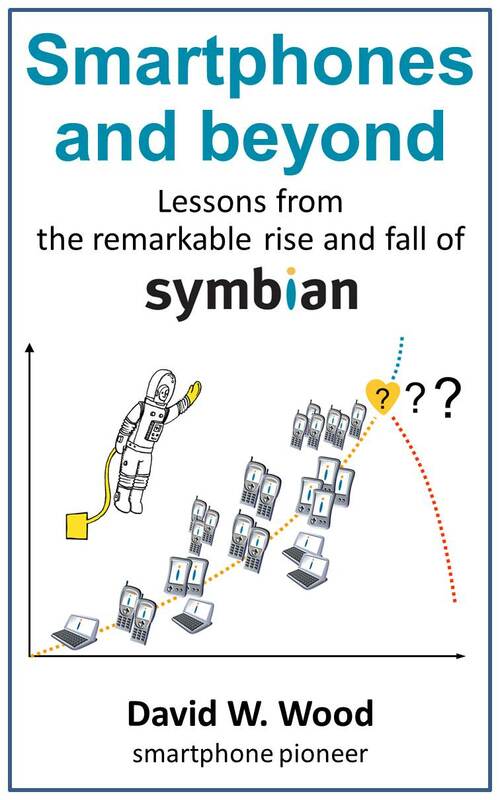 In Smartphones and beyond, David Wood, the only executive to remain on the Symbian leadership team throughout virtually the entirety of the company’s history, gives a “warts and all” account of the remarkable rise and fall of that company, and its role in pioneering the smartphone industry. En route, he suggests numerous practical lessons relevant to the future evolution of other forms of smart technology. This Kindle book is available on Amazon: UK site and International (US) site. Note that readers without Kindle devices can read the book on a convenient app on their PC or tablet (or smartphone!) – these apps are freely available. Click here for information about the author of the book, and how to contact him. Click here for a complete list of the chapters of the book, together with links to short extracts from each chapters.